Spending time at the University of Rochester means feasting on an ever replenished smorgasbord of historical, philosophical, literary and visual delights. 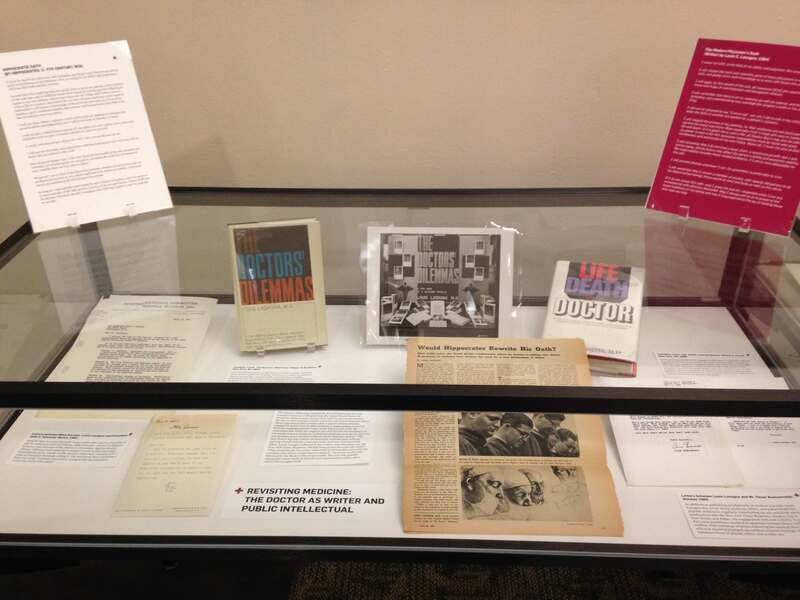 The current exhibit in the Rush Rhees library is no exception. 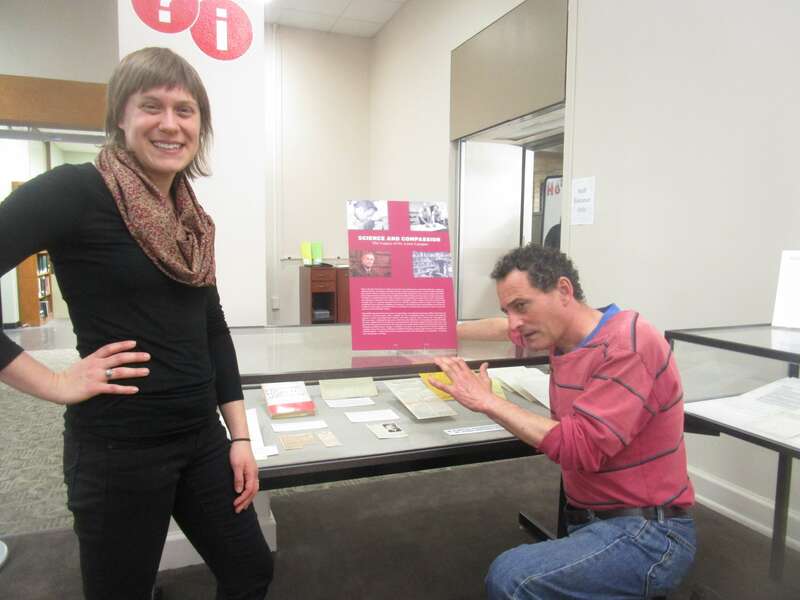 Yesterday Abby Glogower, a Ph.D. candidate in the Visual and Cultural Studies Program, offered a community presentation on the exhibit, Science and Compassion: The Legacy of Dr. Louis Lasagna displayed near the Circulation Desk. Abby’s talk traced Dr. Louis Lasagna’s remarkably diverse 50 year career, including 14 at the University of Rochester. Her passion for the subject bubbling, Abby took us from the post war medical boom when Dr. Lasagna did pioneering work in pharmacological research to his activism for world disarmament during the Cold War to his advocacy for people with Down’s Syndrome (including his son Chris ) at a time when “retarded” was still a commonly used medical term. In 1963, Dr. Lasagna wrote a bestseller, The Dr.’s Dilemma (which Abby says achieved the status of “beach reading”). Here, Dr. Lasagna trained a reflective lens on the medical profession, asking questions about doctors’ “clay feet” and urging his fellow practitioners not to see themselves as infallible gods. To this end, he wrote an updated version of the ancient Hipporcratic Oath to help guide doctors through the challenging professional ethics of the 20th century and beyond. In the 1980s, during the political-charged era of the AIDS epidemic, Dr. Lasagna sought to reverse the “Drug Lag” he determined surely cost lives. Revealing Dr. Lasagna’s lighter self, the display has memorabilia from his days as the founder of the Mighty Lasagna Players — the medical Monty Pythons of their time — who amused and tweaked the UR community: Star Drek (1976), The Phunny Pharma Awards (1978) and Elmwood Avenue Blues (1982). Perhaps the most powerful artifact is a program from a March 16th, 1983 concert. 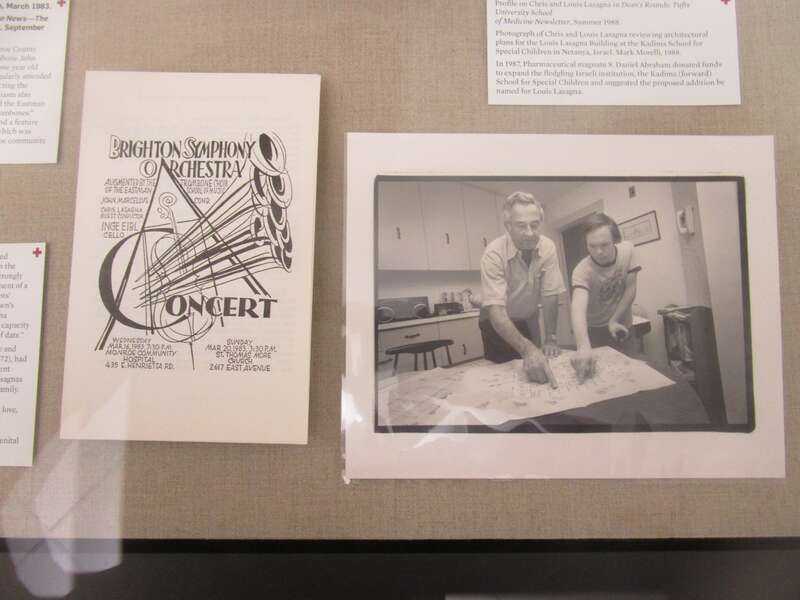 In what might have been the first symphony conducted by a person with Down’s Syndrome, Chris Lasagna directed the Eastman School of Music Trombone section along with the Brighton Symphony Orchestra in a performance of 76 Balloons from The Music Man. As the subject is not your academic field, how/why did you become interested in Dr. Lasagna? 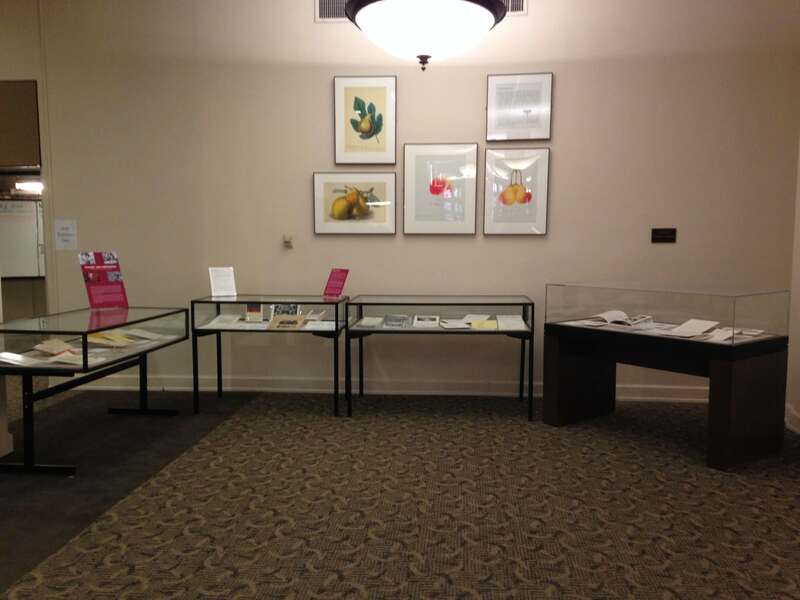 This exhibit grew out of a project I started in the summer of 2014 through my work as a program assistant in the department of Rare Books and Special Collections. Additional material had come in and needed to be integrated into the Lasagna Papers collection–luckily I got the job! At first the topic was daunting — after all, my academic background is in Art History– how could I make sense of so much scientific and medical material? With time, however, I began to realize how well this collection speaks to issues beyond chemistry and pharmacy. The science and medicine here did not exist in an intellectual vacuum but were part of larger conversations in mid-twentieth century American history and society about the roles of government and industry, consumerism and advertising, ethics and social justice and more. Making these connections helped the material come to life for me and I’m grateful for all that I’ve learned working on the collection. What were some of the exciting moments as you assembled the exhibit? One of the biggest challenges was the limitation of four cases–I wanted to fill even more! Figuring out how to pare down the material and group it into sections was some of the most important intellectual labor during the project. Fortunately, our exhibitions manager, Travis Johansen, is very talented and skilled at helping exhibit narratives emerge. It was very exciting to make a story emerge from seemingly endless choices. This felt especially “real” during installation where many months of “behind the scenes” researching and writing gained its physical (and public!) form. How close did you get, so to speak, to Dr. Lasagna? How well do you feel you know him? What a great question! I can gather that he was gregarious, clever, fair, extraordinarily busy and productive and also very well liked. I am pretty sure he is someone I would have grateful to known personally and have even found myself wondering, when faced with the occasional dilemma, WWDLD? (What Would Dr. Lasagna Do?) And yet, something that always with me as I worked on his materials was wondering about everything that was *not* there. The Lasagna Papers are almost entirely of a professional nature: documentation related to his research, publications, teaching, speaking and travel engagements, academic correspondence and so on. I know he had a rich family life but just about everything related to that exists in some kind of other archival context — probably maintained within the family. My absolute favorite moments during this project were stumbling across a rare scrap of poetry written by a Lasagna, or the occasional touching letter from his father or one of his children. These small mementos pierced the professional bubble and offered the smallest glimpse into the man’s private world beyond the archive, the one that probably only the people closest to him could ever really know. 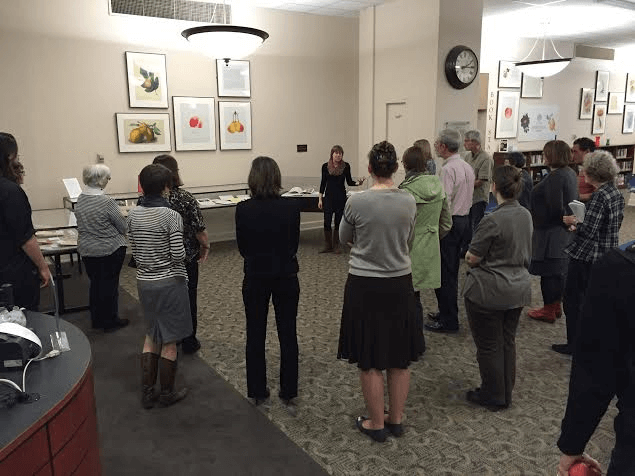 Also, as reported in the Rochester Business Journal in 2013, Abby was one of 5 curators for the library’s “Nurturing Inquiry” exhibit.